And Now a Tip for the Forgetful! Postcards are a common request of travelers. And with all of the lists that need checking and the itineraries and transportation to arrange, postcards are a common thing to forget. And depending on the size of your postcard request list, postage can get expensive. Sometimes people tell white lies about their fantastic vacations to impress some office mates,or to get out of a social obligation. Whatever your situation, the problem is still the same: You didn’t send those postcard!. Wouldn’t it be awesome if there was a service that sent out handwritten postcards from your destination so the postage matched up? Well Roma Postcard has the solution to your postage problems. This neat website will hand write a customized message on the postcard of your choice and send it to anywhere around the world. Sneaky, right? And business is booming. Roma Postcards has sent out cards to Belgium, the United Kingdom, Canada, Portugal, Spain, Australia, the United States, and even some postcard within Italy. 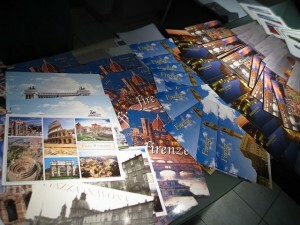 So far the site offers a small selection of postcards from Rome, the Vatican, Florence, Verona and Ravenna. The process is simple. Browse the site for the location you need, choose a card, fill out a small online form, and ta-da! you have a handwritten post card in the mail. Roma Postcard makes two major promises: all cards are sent out within 2 days and your secret is safe with them. No company trademarks or signatures or any other hints that you’ve used the service, your privacy is important. And it’s cheap! The postcards are a steal considering the exchange rate, with prices hovering between $5-7 each. Every purchase, no matter how small, includes free priority shipping with the Poste Italiane. Pretty sweet deal for the forgetful and/or the people who told a little white lie. Let’s just hope none of your friends remember what your handwriting looks like.